It looks like a book, it feels like a book, and it even smells like a book. But watch out...madness and mayhem lie within! Debut author Adam Lehrhaupt urges you NOT to take a walk on the wild side in this humorous, interactive romp with inventive and engaging illustrations from Eisner Award–winning comic artist and rising star children’s book illustrator Matthew Forsythe. Warning: Do Not Open This Book? won the E.B. White Read-Aloud Honor award and was a 2013 Huffington Post Best Picture Book honorable mention and an ALA Notable Children’s Book. This quirky, subversive creation begs to be enjoyed again and again and again. Matthew Forsythe is an award-winning comic book artist and illustrator. His first children’s book, My Name Is Elizabeth! by Annika Dunklee, was a named a 2011 New York Times Notable Children’s Book. His first comic, Ojingogo, was nominated for an Eisner Award and won a Doug Wight Award for Best Experimental Comic. His illustrations have appeared in many publications including The New York Times and The Wall Street Journal. Formerly the lead designer on the animated series Adventure Time on the Cartoon Network, he now lives in Canada and is working on his next book. Visit him at ComingUpforAir.net. Lehrhaupt’s debut predictably counts on curious readers to ignore the dire warning and its accompanying threat, “You don’t want to let the monkeys out.” As pages turn, lemurs, baboons, and rhesus monkeys stalk into the spreads, where they pluck at the printed words and paint trees for themselves. The narrator’s uninspired pleas to readers (“Can you stop now? Everything used to be so good”) scaffold Forsythe’s (My Name Is Elizabeth!) primitive, earth-tone watercolors of the escalating melee. When a flock of toucans joins the troublemaking monkeys, and a giant alligator emerges from the right margin, readers get to be part of the solution: “You can catch them all in this book!” If Forsythe’s grainy illustrations echo Jon Klassen’s picture books, the mood in this outing is light and message-free. Debut author Lehrhaupt and New York Times Notable Children’s Book illustrator Forsythe (My Name Is Elizabeth!, 2011) team up for a laugh-out-loud romp through monkey-infested pages. From the title and the endpapers’ warning signs (“I guess you don’t mind being mauled by mo___s”) to the opening pages’ admonishments not to venture further, the narrator repeatedly warns readers not to open this book. Those who do not heed these pleas release a troop of artistic monkeys that wreak havoc on the book itself. Nothing is safe from these wild invaders—not the art and not the text. When the narrator again urges readers to turn back, toucans join the fracas. Forsythe uses the same warm palette for the toucans as the monkeys, adding a nice continuity to an otherwise strange addition that slows down this well-paced story. Before the toucans can do much, an alligator shows up, frightening everyone. With chaos reigning supreme, the narrator turns to readers for help in laying out a plan to snare the animals inside the book. Forsythe’s digitally rendered art is hilariously expressive and laugh-worthy in its own right, and it is well-paired with Lehrhaupt’s spare comic text, successfully creating a book that is enjoyable both to read and behold. In the tradition of humorous metafictive offerings of the past, this celebration of chaos is a veritable festival of fun. Audiences are warned right away about about opening this picture book: “You don’t want to let the monkeys out.” The intrepid and curious, though, will forge on to find a single monkey poking his head in from the edge of the page—followed by a barrage of monkeys on the next, who muck everything up by fiddling with the text and splashing paint all over the illustrations. Continuing (and ignoring the narrator’s pleas to stop) leads to a slew of similarly invasive toucans and finally one very large and scary alligator. All hope seems to be lost until the narrator has an idea: “Only you can make things right. You should set a trap!” Once the trap, a banana, has been rigged, audiences can then slam the book shut with squeals of glee, keeping the mess of creatures stuck inside... Forsythe’s earth-toned, messy digital illustrations escalate along with the text, starting with warning signs against an austere white background but, as the critters get out of control, becoming full-bleed chaos. The art is also also reminiscent of a kid’s watercolor paintings, a feeling enhanced by the blob-shaped monkeys and wonky alligator—and the fact that the monkeys themselves draw the trees in the background. Kids following along will relish the exhilaration of breaking the rules as well as the simple but clever means of cleaning it all up. Expect the titular exhortation on this one to be thoroughly ignored again and again. 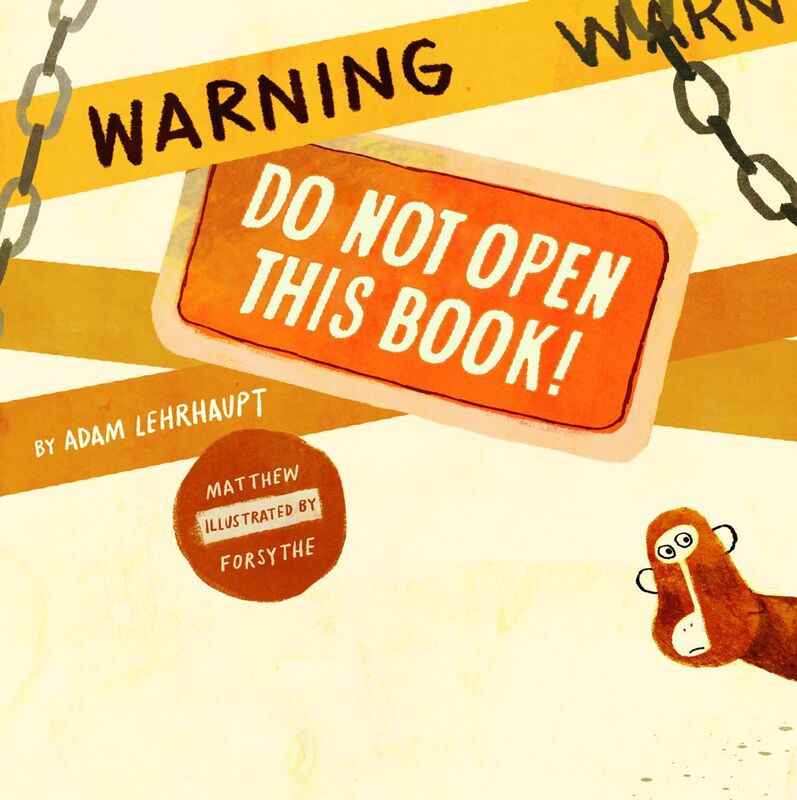 In the spirit of Press Here and other inventive books that play with the possibilities of the page turn, this debut from author Adam Lehrhaupt unequivocally warns children to close this book and turn away from it. So... kids won't be able to resist, just to see what their act of rebellion yields. "Maybe you should put this book back. You don't want to let the monkeys out," the book begins. Matthew Forsythe (My Name Is Elizabeth!) draws a wide-eyed monkey on a sign that says "DANGER." When children inevitably turn the page, they are greeted with, "Why did you turn the page? Didn't you see the warning? Stay on this page. You are safe here." Signs that read "Stop," "Go Back" and "U-Turn," plus barbed wire and orange pylons, suggest that readers proceed at their own risk. On the next page, a monkey appears from stage right ("Oh, no. Now you've done it"); others follow. They parade onto the pages wielding paint cans, tubes of paint and brushes ("What a mess! Naughty monkeys"). While the story warns against impending doom, children will delight in the consequences of each page turn; the monkeys' artwork results in a lush and tropical landscape of gold, forest green and burnt orange. Everything halts due to the entrance of a predator, and it's up to readers to save the naughty monkeys. Discover: A picture book that warns children to walk away from it--ensuring they'll eagerly turn every page to view the consequences. Reverse psychology runs rampant in this amusing collaboration between first-time author Lehrhaupt and award-winning illustrator Forsythe. Opening this book is like venturing into a cordoned-off danger zone. Those who disobey the cover threats are met with four pages of comically dire signs: “Come On . . . Seriously?” and “I Guess You Don’t Mind Being Mauled by Monkeys.” There’s a catch-your-breath moment after the reader turns the next page, quickly followed by a riot of monkeys barreling across a double-page spread, toting paints, crayons, and a guitar. The narrator implores the reader to get out before things get worse. And they do get worse, with the destructive monkeys being followed by toucans and an alligator that opens his jaws very, very wide. At last, the narrator supplies the reader with an ingenious way to lure the whole zoo back into the confines of the book. The earth-tone digital illustrations well replicate the messy monkey business of painting all over the trees and pages, and the playful arrangement of text adds greatly to the book’s mayhem. Wonderful chaos.